Organizers with the Solidarity Committee of CNY and ANSWER Coalition show unity with striking Scriba workers. 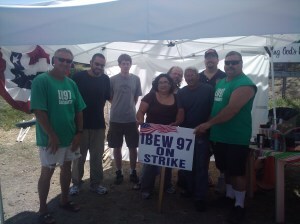 At midnight on July 8, IBEW Local 97 workers went on strike at the Nine Mile Point nuclear plant in Scriba, NY. Union representatives and management staff from Constellation Energy Nuclear Group had been negotiating a new contract for two months before the strike, but management was at that time determined to force deep cuts on the workers. Union members voted by an overwhelming margin to reject management’s contract offer. Even though the union had made numerous concessions, including having members pay more for health and prescription care, job specification changes and the elimination of some jobs to save the company millions of dollars, Constellation Energy wasn’t satisfied. They wanted to “modernize” the formula for one of the pension plans. This “modernization” would have reduced the rate of growth of the plan and affected the retirement benefits of workers with the least time on the job. Some workers had been called by management at their homes and asked to return to work in spite of the picket lines. Not one worker took management up on any of their offers, some which were very lucrative. During the strike, the plant was run by management employees familiar with the operations of the plant, working 12-hour shifts. In other words, Constellation Energy put their own profits above the safety of the greater community. Striking workers said that there was no way these employees could properly manage the plant to maximum efficiency. “We're supposed to believe that after a few hours of training that they can take over these jobs. It's like trying to do the work of 10 skilled people with one barely-trained person”, one striking worker told Bruce Peak, an organizer for the ANSWER Coalition. On July 26 an agreement was reached with Constellation Energy. The management group agreed to leave the pension plan untouched and to extend the contract for four years with a 13.6 percent improvement in wages over the life of the contract, including a 3 percent pay raise in the first year. Workers were back on the job the following day. This shows what a concerted, unified effort to protect working-class families can accomplish. Working-class unity is becoming increasingly urgent, as the Democratic Party and GOP work together to make workers pay for the capitalist’s crisis. The Syracuse ANSWER Coalition extends our deepest solidarity to IBEW Local 97 workers.